Cooking with Nonna Nominated for Four Taste Awards! Great News!!! Cooking with Nonna has been nominated for four Taste Awards. The awards ceremony will be held in Los Angeles this spring. Check all the nominations HERE! Please wish Cooking with Nonna luck!!!! Announcing the 2019 - Italy with Rossella Culinary Tours. Join Rossella on her 2019 Culinary Tour in sunny Italy. This year the tour will be held right in the middle of summer. Join Rossella on the beautiful Amalfi Coast. Please visit the page below for all detaild about the tour. Spaces are limited, so reserve your spot fast! Now available in La Bottega sone stylish clothing for grown ups and some cute items for the little ones. Take a look at the Forget Santa, I'll Ask Nonna t-shirts both for boys and girls available up to size 8. These are sure to melt Nonna's heart for Christmas. 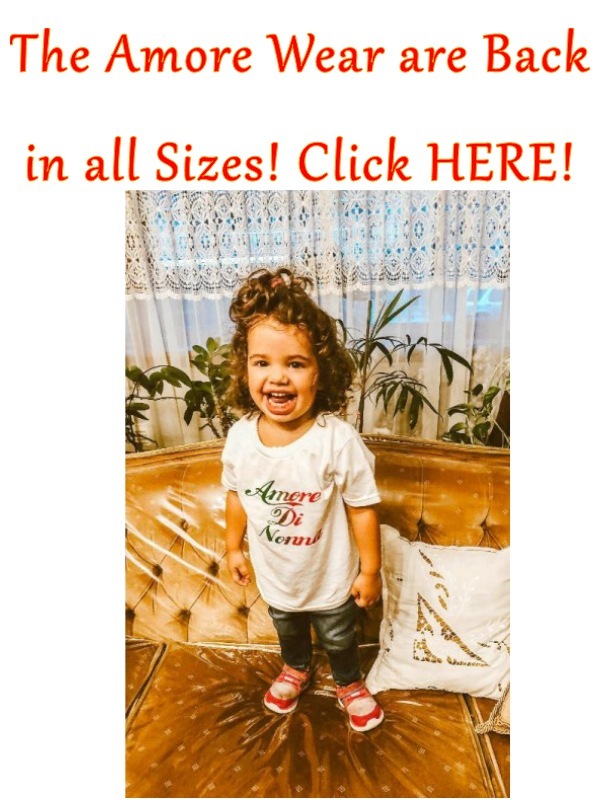 Also take a look at the Amore di Nonna and Nonno clothing which are available in onesies and t-shirts. Lastly, don't miss the beautiful fleeces designed by Rossella which make the perfect Christmas presents for any lady. La Bottega della Nonna is Open! Start your Free Virtual Tour!